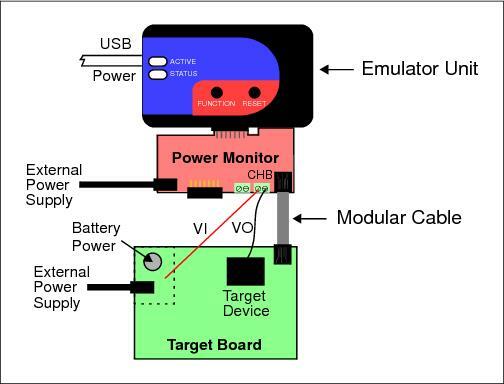 The Device Power configuration is used in cases where only the microcontroller or a section of the target application is desired to be monitored. Connecting the Channel B (CHB) Voltage Out (VO) terminal to the device or target section allows small current measurements can be made, typically in the range from μA to a few mA. The modular cable still needs to be connected to provide communication to the emulator. Connecting the Channel B (CHB) Voltage In (VI) terminal to the target power supply section allows voltage measurements to be made. In the Project Properties window, click on the “Real ICE” category and select the “Trace and Profiling” option category. Under “Power Measurement”, select “Processor Only (1μA - 9mA)”.